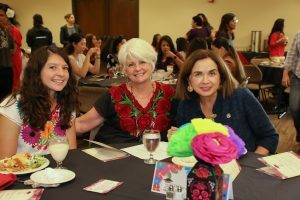 On Thursday, September 27, 2018 the SDSU Latina Network hosted a luncheon with the SDSU community as an opportunity for students to network with Latino faculty and staff; in addition to raising funds for student scholarships. During this event, we got the opportunity to hear the opening remarks of our very own President Adela de La Torre. Dr. De la Torre joined SDSU from the University of California, Davis, where she has served in several leadership roles, culminating in vice chancellor, student affairs and campus diversity. Being of Latino descent, we are happy for the work she will do at SDSU. We are positive her presence at our institution will inspire and empower other Latino/a students reach their dreams of higher education!